Denmark or Finland: which country is more expensive? This comparison of travel costs between Finland and Denmark examines average prices across multiple categories. Please visit each country's individual budget page for more detailed information. Should you visit Denmark or Finland? Denmark and Finland are both in the Scandinavian region of Europe. The region is notoriously expensive for travelers and in general, Denmark is a bit more costly than Finland. Denmark is a small country, and most visitors spend the majority of their time in Copenhagen. The city is very cosmopolitan and international, and there's no shortage of things for visitors to see and do. Whether you're interested in history, nightlife, or just soaking up the atmosphere, Copenhagen is a fun place to spend some time. It's often possible to include a trip to Denmark onto a longer trip to Scandinavia or Europe and many visitors pass through the country when exploring other areas. Finland is another beautiful and fun country to visit. Helsinki is the capital city, and it is a fun place to spend some time. In general, Finland is relatively flat with many beautiful lakes that provide excellent fishing and outdoor opportunities. Finland is also known for its year around outdoor sports. Skiing, snowmobiling, and ice diving are all popular activities. When is the best time to visit Denmark and Finland? Like most Scandinavian countries, both Finland and Denmark is best visited during the months of June, July, and August. This is when the weather is the warmest and the tourist facilities are opened and fully operational. By fall many places start to shorten their hours. July is a holiday month for many Danes, who head to the countryside. These areas are most crowded during this month, but they still don't experience the intense crowds that you might experience in other countries. In Finland, many residents take a holiday during the month of August and head to the countryside. Prices can be a bit higher during this time and some places get a bit more crowded. Fall is a nice time to visit Finland as well, although temperatures start to drop as early as the beginning of September. Lapland is a beautiful area during these months as the colors turn to gold and orange. Many attractions do reduce their hours starting in September. Winters are actually a bit milder in Finland than in other parts of Scandinavia, but temperatures are still very cold. This is an interesting time to visit the country because there are plenty of winter sports that you can enjoy including cross-country skiing, snowmobiling, and ice diving. Why is Denmark more expensive than Finland? Although both Finland and Denmark are very expensive, you can expect to spend slightly more on a trip to Denmark. The country is known for its high cost of living and its high quality of life. The currency is the Danish krone and the exchange rate can also impact how far your money goes. In general, hotels and hostels are quite expensive, as is food. Although Finland is slightly more affordable, transportation costs can be quite high because the country is much larger than Denmark. 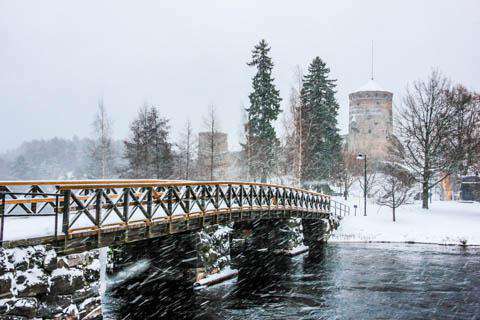 There are also many organized activities in Finland that visitors often book in advance. These activities can significantly increase the cost of your trip. What are the most expensive and cheapest cities and regions in Denmark and Finland? 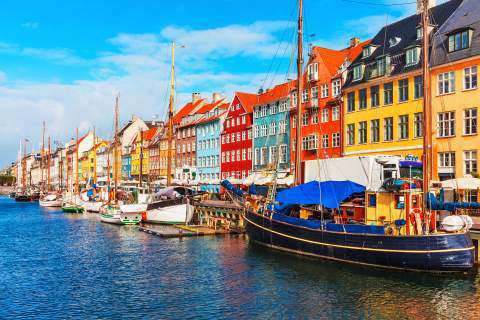 Copenhagen is the most popular, and most expensive place to visit in Denmark. Because Denmark is such a small country, most visitors spend the majority of their time in Copenhagen. Everything from food to accommodation can be expensive. Making reservations well in advance and booking any train or ferry tickets can help you keep your costs in check. Finland is an expensive country to visit, but more affordable than Denmark. Helsinki is a relatively expensive city, but it is possible to find some reasonably prices hostels and budget hotels. In particular, Lapland is an expensive area, in part because visitors often book organized activities and excursions before they arrive. These activities and excursions can be very expensive and raise your overall daily budget. If you're hoping to save some money, do some research and figure out what you can do independently, which is often the cheaper way to go. How you can save money when visiting Denmark and Finland? Transportation is very expensive in these countries. Buy tickets well in advance and research any discount options that might be available. Because both Denmark and Finland are so expensive, they are great places to cook for yourself. Restaurants can be expensive so find a local grocery store and plan to prepare your own meals. If you really want to try the local restaurants, eat out at lunch when prices are a bit more reasonable. Look into discount cards for specific cities to see if they'll save you any money. If you plan to rent a car, research all of your rental car options. There are often some local places that offer more affordable rental cars than the major chains. Taxis can be very expensive, so look into public transportation whenever possible.